There was a time when people said that schools on the whole were “good.” Schools were supported by parents and multiple generations grew up in the same schools where teachers had already taught the older siblings. Schools were better when “we” were students; we did not dare misbehave or our parents would get us. We see schools as rife with violence and poor academics now. Kids can do anything and teachers are just there for the money and the time off in the summer. Actually, most surveys still report that “my child’s school” is good even when giving those other schools a failing grade. 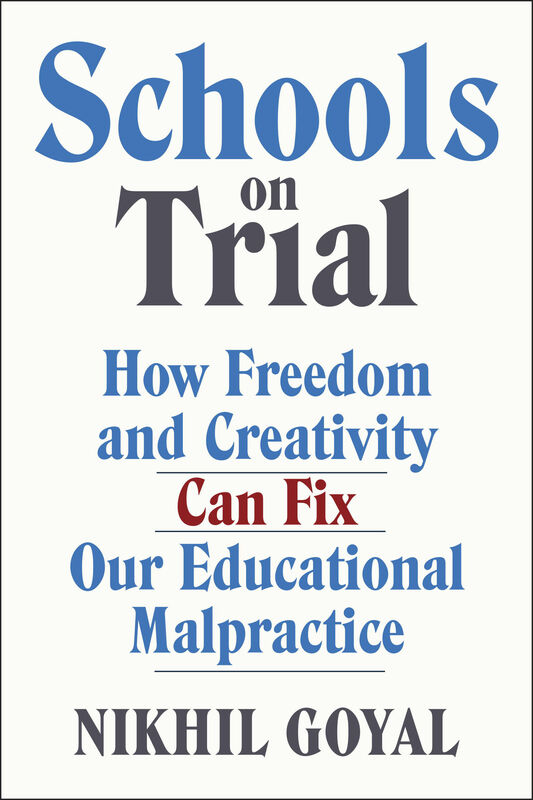 Innumerable proposals to fix public schools have appeared over the last century. Many of these came from the very experts that Goyal reveres: Dewey, Montessori, Freire, Holt, Kohl, Kozol. Nearly every proposal has merit, but nearly every proposal works best for the limited group to which it is first applied. That “first cohort” is most likely to succeed because the enthusiastic originators are on site, and it benefits from the Hawthorne Effect which found that subjects who know they are being observed tend to do better. It is during the replication when disciples are in charge, and have “improved” ideas on how to modify and make it better, and the spotlight is no longer on that the difficulties arise. Plus, schools exist in different neighborhoods with varying aspirations and conflicting levels of support or non-support. A superintendent from Los Angeles once told me that “No mother ever sends her child to school to fail.” Peer pressure, however, can certainly derail that mother’s best intentions. The author of the newest solution is Nikhil Goyal, a journalist and college student with excellent credentials. Named to the Forbes 30 Under 30 list in 2013, he has written for the New York Times, MSNBC, and other outlets. I am the son of a teacher and a 30-year veteran of the classroom and administrative leadership positions, and an 11-year veteran of the commercial test assessment business. I do have biases and I recognize the failings of the American education system; I also recognize it successes. Goyal writes from personal experience and anecdotal interviews with students, interviews facilitated, according to him, by his youth. However, he does not provide significant evidence of interviews with poor, disadvantaged students locked in poverty; he concentrates on case histories of bright, middle and upper class kids who were disenchanted with school but had the support system to even risk dropping out and pursuing a dream. He cites one instance in which “low income and minority families were not comfortable sending their children to this ‘weird school.’“ Any plan must help the least endowed student. Hard data to support Goyal’s position in the short term or the long term is not in evidence. His position is to move toward more self-directed learning so that students learn at their pace when they are ready. 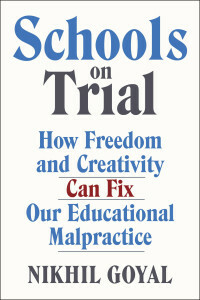 While he accurately and “passionately” argues that the mainstream media reports in a polarizing fashion, he has done the same thing in this screed about the “anti-democratic and cruel nature of contemporary schooling.” And, he is aided by the marketing strategy of Doubleday which deems this “An all-out attack on the American way of education and a hopeful blueprint for change by one of the most passionate and certainly youngest (twenty) writers of this subject.” Or this from Doubleday: “Are America’s schools little more than cinder-block gulags that spawn vicious cliques and bullying, negate creativity and true learning, and squelch curiosity in their inmates, um, students?” The sub-title even touts “Educational Malpractice.” Goyal’s valid points are couched in language that will ensure that the leaders of educational bureaucracies will ignore him. Schools are often hide-bound bureaucratic systems that warehouse students as a means of control and adherence to a stated curriculum. Yet, throwing them open to self-directed learning is no miracle panacea and neglects the societal pressures that demand that kids fit into a model and behave. Still, even as school systems struggle with declines in funding and increased controls from legislatures far removed from the battlefields, schools are innovating and creating a variety of alternative options that serve a wide gamut of student needs. No effort to reform schools will succeed until the various stakeholders can come together without rancor and with a secure focus on the best interests of every child. Sadly, there are as many ideas of “best interests” as there are groups. Journalist and Forbes “30 under 30” in education nominee Nikhil Goyal delivers an impassioned screed against the American educational establishment.